Capitalism hasn’t enjoyed the greatest press in the last decade or so; the near destruction of the economic system at the height of the Credit Crunch (or Great Financial Crash as it is more commonly referred to these days) and the increasing disparity between the ‘haves’ and the ‘have-nots’ is helping to push the agenda for alternative economic models. This is particularly so amongst the younger generation who are seeing any chance of property ownership slip further into the future and working life that might take them into their seventies. Who knows what State pension will be available at that time? However, if you believe in the human capacity to invent, innovate and create opportunity and you believe the future will be better than the past then capitalism is the only economic model that supports that belief. After all, Socialism doesn’t boast a track record to be proud of. 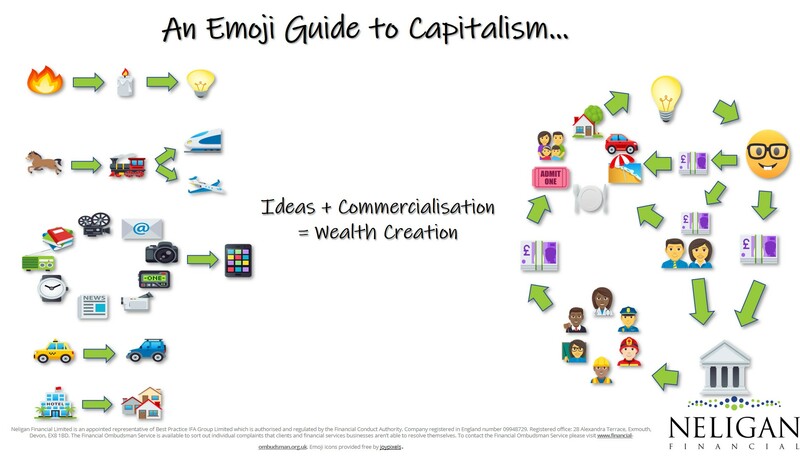 So this latest emoji guide is a non-economist’s guide to capitalism. From campfires came candles and then the invention of the lightbulb by Thomas Edison in 1878 which enabled increased productivity for factory workers and comfort for wealthier homeowners who could afford such luxuries. Efficiencies of mass production and distribution have since brought safe lighting to all but the poorest homes. The railroads and cars replaced horses and enabled goods and commodities to move around continents. Future innovations enabled it to be done faster and between continents when planes were commercialised, opening up the ability to transport perishable goods to new markets. More recently, the invention of the iPhone put multiple products into a pocket-sized device and in so doing created a huge cultural shift and one of the world’s most valuable companies. Innovation doesn’t just apply to products either: Uber and Airbnb have used technology and social change to disrupt the taxi and hotel markets respectively and bring cost savings and better user experiences to the masses. When an invention becomes an innovation it drives economies. An inventor has a lightbulb moment and discovers a demand for a product or service. When done successfully a profitable business is created. With the profits, the entrepreneur is able to pay herself and fund her desired lifestyle. Furthermore, she is also able to employ staff who can fund their lifestyle. Not only that but both the business owner and employees pay taxes. Tax receipts enable governments to employee nurses, police, firefighters, teachers, civil servants and to fund capital projects (which in turn creates job opportunities). These government employees buy goods and services to fund their lifestyles and pay their taxes. The purchase of good and services helps grow both the local and global economies by employing staff to meet growing demand. Then another entrepreneur will have their own light bulb moment and find a way to offer a product or service more cheaply or better than can be currently done and so the cycle keeps moving onwards. 80% of the world’s population has access to electricity. But What About You And Your Situation? Let’s forget about the bigger, global picture and think about you. If you are giving any thought to your future self you need your money to be working hard enough so that you have enough wealth to be able to stop work when you want and to be able to live your ideal lifestyle for the rest of your life (in other words to have financial freedom). Historically the most effective way to do this, and I see no valid reason why it won’t be the case in the future, is to own shares in the great companies of today and tomorrow who will provide you with a long-term return on your capital and regular income in addition. Capitalism generally and the stock markets specifically are the only drivers for that growth opportunity. If you would like to understand how you can benefit from the entrepreneurship of others to help fund your ideal lifestyle for the rest of your life, please do get in touch (www.neliganfinancial.co.uk/contact-us).